Due to the ripeness of the tomatoes I was using and the natural bitterness of the ancho chili I needed a good amount of sugar in each batch to give this sauce balance. I made a mild and hot version. 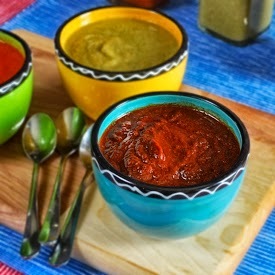 The mild, which was also very sweet was the most popular red sauce of the four that were put out for the party. 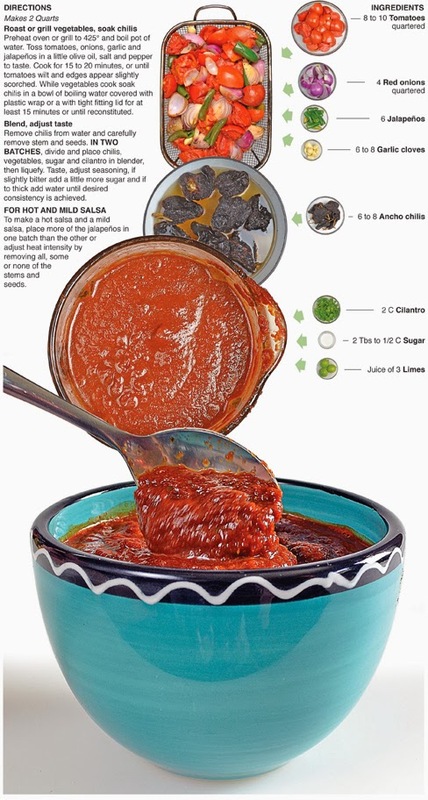 An Ancho chili is a dried poblano pepper and is the most widely used dried chili in Mexico. It has a “dark” or “rich” flavor similar to prunes or raisins with a slight amount of bitterness. It is considered to have a mild to medium heat. Preheat oven or grill to 425° and boil pot of water. Toss tomatoes, onions, garlic and jalapeños in a little olive oil, salt and pepper to taste. Cook for 15 to 20 minutes, or until tomatoes wilt and edges appear slightly scorched. While vegetables cook soak chilis in a bowl of boiling water covered with plastic wrap or a with tight fitting lid for at least 15 minutes or until reconstituted. Remove chilis from water and carefully remove stem and seeds. IN TWO BATCHES, divide and place chilis, vegetables, sugar and cilantro in blender, then liquefy. Taste, adjust seasoning, if slightly bitter add a little more sugar and if to thick add water until desired consistency is achieved. 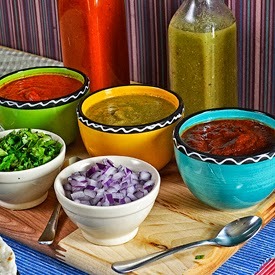 To make a hot salsa and a mild salsa, place more of the jalapeños in one batch than the other or adjust heat intensity by removing all, some or none of the stems and seeds.